spend two weeks in paradise! As many of you know, we've been running our Introduction to Permaculture courses for several years. Over that time hundreds of people from all over the world have come to spend a week with us, studying and being inspired by the paradigm-shifting philosophy of Permaculture. More than a method of creating beautiful organic gardens, Permaculture is a whole new lens through which to view your world. We're super excited to announce that in 2017 we teamed up with Abundant Edge to expand our offerings and bring you our one-week Introduction to Natural Building course! Growing out of years of experience and his deep appreciation for sustainable building design, course leader Oliver Goshey teaches you how to work with your local surroundings--wherever they may be--to create beautifully designed natural structures. Knowing that many of you will be excited to take advantage of both offers, we have scheduled the workshops to run over two consecutive weeks. What's more, we want to help you do it! 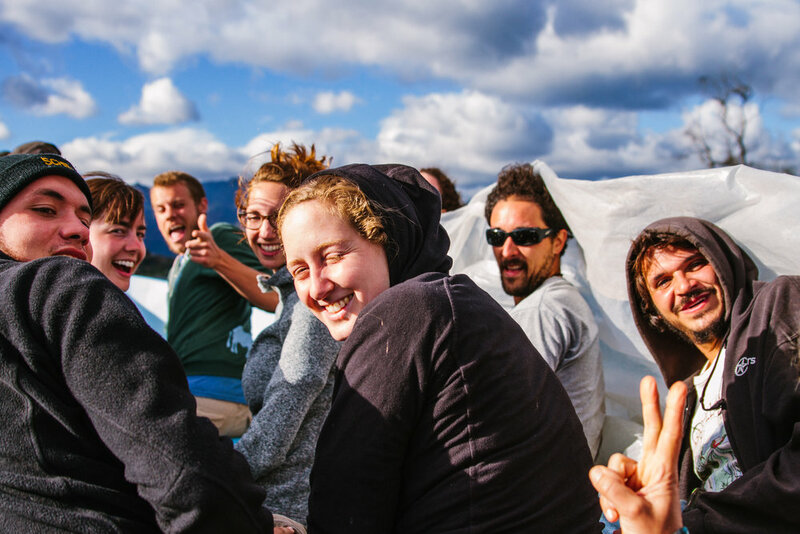 We're happy to offer a package deal with super savings to everyone who would like to stay with us for two weeks to study Permaculture and Natural Building. See below for details. Over the course of one week, you'll delve into the philosophy and ethics of permaculture through a series of thought-provoking lectures and hands-on practicals. See how water systems, garden and landscape design, animal husbandry and more come together in a beautiful fusion of resilience and cohesion. You'll learn to build swales, care for chickens and goats, propagate plants like a ninja and tour indigenous sites to see how permaculture is applied on the community level. Our all-inclusive offering covers the course, lodging, and all meals during the week. This is the course for those of us who never outgrew our love of mud puddles and sandboxes! Throughout the week you will learn about various natural building techniques such as adobe, cob, and natural plasters, with an emphasis on reading your landscape to work with, rather than against, nature. The pièce de résistance is a fully-functional lorena rocket stove which the class builds over the course of the week in a local household. Our all-inclusive offering covers the course, lodging, and all meals during the week. Next, follow the link below to register for Introduction to Natural Building and select the $375 "Remainder/Course without lodging, breakfast, or dinner" option. Don't worry--both weeks will be all-inclusive! have you already studied with us? No problem! We'll happily extend the discount to previous students. Just shoot us a message and we'll get you in on the deal. Can't make the october course? We're offering our package deal throughout all of 2018. Just find a month that works for you and register for both courses as described above. Studying Permaculture and Natural Building in Central America offers amazing opportunities to learn from indigenous cultures, rich natural patterns, and enormous diversity. Permaculture in Central America is representative of the edge effect or Edge Valuing Principle of Design. As one of the world’s centres of biodiversity, Central America attracts people from all over the world interested in learning through nature. Permaculture practices and sustainable building designs can be seen in action via the surviving indigenous traditions that are common in Central America. Studying permaculture and natural building in Central America offers designers great opportunities to learn from diverse groups of people in incredibly diverse natural settings.